Do you ever wish you could enjoy the outdoors in complete comfort any day or evening of the year here in the Washington, DC or Northern VA area? A four season room is the perfect solution that allows you to be outdoors, in nature, in almost any weather—without leaving the comfort of your Richmond-area home. A four season room provides you safe, comfortable shelter and complete climate control along with an uninterrupted view of your surrounding landscape and breathtaking skyline. This versatile living space is an expansion of your home, done in a creative, effective manner—by enclosing a porch, deck, or balcony. The straightforward construction of a four season room makes the indoor-outdoor room a great investment. It’s a relatively low-cost, quick home renovation that expands your living space, giving you more usable square footage to enjoy. Your four season room adds value to your VA, WV, or MD home, providing a unique, enviable home space for you to enjoy and share with others. If the idea of a complicated, inconvenient construction project seems daunting, you’ll love the rapid, organized construction process of your new four season room. As expert local contractors specializing in creating four season rooms, sunrooms, conservatories, and screened porches, Total Remodeling Systems builds your new four season room around your existing porch or balcony area. We don’t need to pour a new foundation, add messy insulation, install wall studs, etc. 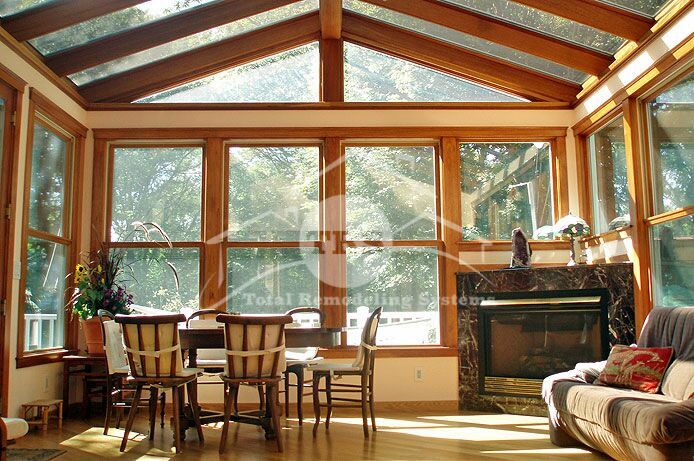 We can create your new sunroom quickly and efficiently. The glass we use provides excellent insulation and, of course, a stunning 360-degree view for you to enjoy in all seasons. How Can You Use a Four Season Room? You can bring nature into your home with a four season room, giving you a place to relax quietly alone, spend time with family, or host friends for special occasions. You can use your four season room year round, in any way you desire. Imagine the possibilities and create your own traditions in your spectacular new space. At Total Remodeling Systems, we’ll help you create your ideal four season room, built to the exact specifications you desire. The four season room experts at TRS will ensure that your new indoor-outdoor room blends seamlessly with the rest of your home’s architecture. Contact TRS today by calling ​(877) 309-8445 to learn more about the options for your new four season room!